If you have ever suffered from heartburn, then you know just how uncomfortable and painful it can be. Heartburn during pregnancy is no different. 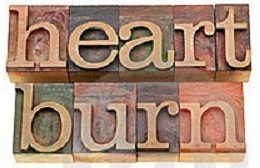 With my first pregnancy I started getting heartburn sometime in the middle of my second trimester. It was pretty bad (my son did come out with a glorious full head of hair though – old wives tale or what?). And, for someone who didn’t even know what heartburn felt like prior to this it was, at times, unbearable. Little did I know that it was gonna be nothing compared to the heartburn I’ve experience this time around. The heartburn started much earlier and has escalated to “severe” status. And I mean a constant, unrelenting, sleeping pretty much sitting up severe kind of situation. How do you deal with this kind of heartburn? I’ve definitely had to come up with some much more fancy relief techniques than popping some tums and avoiding coffee. It would definitely help to understand the reasons behind pregnancy heartburn, for starters. For those of us in the baby making way, heartburn can have some different triggers than for the average joe. Yay! Another reason to love those hormones. Progesterone is responsible for relaxing muscles in your uterus, but in the meantime also relaxes the muscles that keep that stomach acid where it belongs. So, it’s much more likely to just back up into your esophagus whenever it feels like. Progesterone is also to blame for this one (along with a large uterus blocking things up). This can cause back up of stomach acids. You are carrying a baby inside you (obviously). The larger the baby gets (and therefore your uterus), the more likely it is to cause you all sorts of discomforts. When it comes to heartburn specifically, it can mean baby + large uterus pushing on your stomach just pushes the acid up and out. So, as you can see sometimes avoiding heartburn is probably just impossible. I mean how do you prevent a growing uterus from pushing stomach acids up? There are some things you can do to at least help prevent it from happening as much as possible and (hopefully) keeping it from reaching severe levels. I have found after dealing with it twice that the general “how to avoid heartburn” guidelines are less than effective during pregnancy, but they do have some merit. Avoid foods that trigger heartburn. I’m sure you’ve heard the list before (coffee, citrus, chocolate, spicy food, etc), and this is only been slightly true for me. Some of these foods do definitely trigger heartburn, don’t get me wrong, but I’ve been able to scarf down all the chocolate and spicy food in the world and feel fine. I would adjust this recommendation to – figure out what your triggers are and avoid them. On the flip side, I find some foods help to ease the burn. Bananas work wonders for me. So, also, figure out what those are as well! Don’t eat big meals. If you are super pregnant, you probably aren’t anyways. But, this definitely helps. Several small, more snack like meals a day help keep the burn away. I actually find if I get too hungry heartburn starts to creep into the situation, so this helps from both ends. Stay upright as much as possible. That includes while sleeping. I sleep with a few pillows to keep me propped up. This helps IMMENSLY. Eat something soothing close to bedtime. This goes against everything they will tell you about heartburn! But, if you’re anything like me you might find yourself waking up in the middle of the night hungry, so this has you covered in more areas than one. Like I said bananas work great for me, so close to bedtime, I eat a banana and have a glass of water. This seems to keep me from getting middle of the night heartburn and waking up hungry. Win/win if you ask me. Take natural digestive enzymes. You can general get these at a health food store or any pharmacy really, but things like papaya and pineapple contain digestive enzymes that help you digest faster and more efficiently. If you don’t want to buy the pills just eat some papaya! Take probiotics. This is in no way a fix it quick solution but more of a long term, mild helper. Probiotics = better digestive = less heartburn. Stomach soothing teas can also provide some relief. Ginger and chamomile are both good at helping keep your stomach acids calm. I find that trial and error is the best way to deal with heartburn. Find what works and go with it. Everybody is different. I definitely find myself popping tums once in awhile. Severe and constant heartburn can cause permanent damage to your esophagus so, if at the end of the day you are still severely suffering after trying it all, I suggest talking to your doctor/midwife.